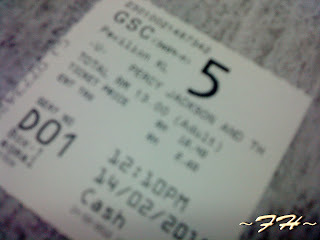 This movie is about Percy Jackson who just discover that he is the son of Poseidon. He is suspected of stealing the lightning bolt that belong to Zeus. 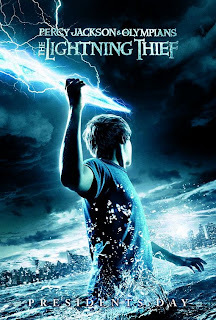 The lost of lightning bolt will causing the war between the Greek gods. Percy with his two friends, Grover (Satyr, half human and half god as the protector) and Annabeth(daughter of Athena) is trying to find Hades as Hades was kidnapped his mother (Hades kidnap his mother because he think that Percy is the lightning bolt thief and want Percy to return the lightning bolt as the exchange for his mother) to explain that he is not the thief and want Hades to release his mother. Percy was succeed to release his mother from Hades with assistance of Persephone (Hades's wife). Poseidon - Sea God in Greek Mythology and brother of Zeus and Hades. He was considered responsible for shipwrecks and drownings. Zeus - King of the Gods and the ruler of Mount Olympus (in Greek Myhtology). He was the god of sky and thunder (sebab tu lah dia ada lightning bolt!). He is the youngest brother of Poseidon and Hades. Hades - in Greek Mythology, he is the God of Underworld. He is the eldest of Poseidon and Zeus. Athena - god of civilisation, wisdom, strategy, strength and justice. She is the virgin patrons of Athens. Porsephone - Queen of Underworld and wife of Hades. She is daughter of Demeter and Zeus. Demeter - goddess who presided over grains, the fertility of the earth, the seasons and the harvest. She is mother of Porsephone. some info of the movie and Greek god is from http://ancienthistory.about.com/od/poseidonmyth/p/Poseidon.htm, http://www.imdb.co and http://news.bbc.co.uk.